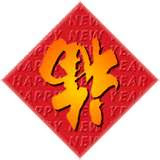 Wishing all a happy and prosperous lunar new year, filled with lots of love and laughter!! Kelly saw this character being hanged on a shop's window, exactly like that, upside down, and she asked why. Haha..
Wishing you and all at home a blessed New Year, good health and big joy!